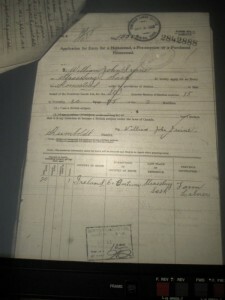 We recently visited the Saskatchewan Archives and obtained a photographic copy of Bill Irvine’s Application for a Homestead. I blogged about this finding over on my Luxegen.ca website. Please go here to visit. Bill Irvine was born April 4, 1892 in Crumlin County, Antrim, Ireland. He left when he was 19 years old, landing at Halifax, Nova Scotia on April 21, 1911. He proceeded to Duval, Saskatchewan and worked a year at Strasbourg. He came from Ireland with a family named John McClughan* who lived near Duval. Irvine Farm - Saskatchewan, 1950s? Bill travelled to Nokomis, Saskatchewan, to file on a 1/4 section (160 acres for $10) SW 1/4 15-30-28 W2 which is situated 20 miles southwest of Young in the McCranny municipality. After three years of proving the land and building a shack, he and Mr. Ron Ronning, Sr. travelled to Humboldt to register the homestead. Ron Ronning signed as a witness. Bill’s shack was on the hill at the northwest corner of his homestead. This was a very windy spot. Sometime between 1915 and 1926, he used that shack for a granary and built a three room house on the southeast corner. He planted a shelterbelt of trees. [*Skip forward a couple of generations - John McClughan's grandson married Bill Irvine's granddaughter Ellen Kerr of Nokomis, not knowing of the past friendship until a short time before their wedding]. Source- writings of Isabel Irvine, wife of Bill Irvine. What do we know about William Irvine in his early years? 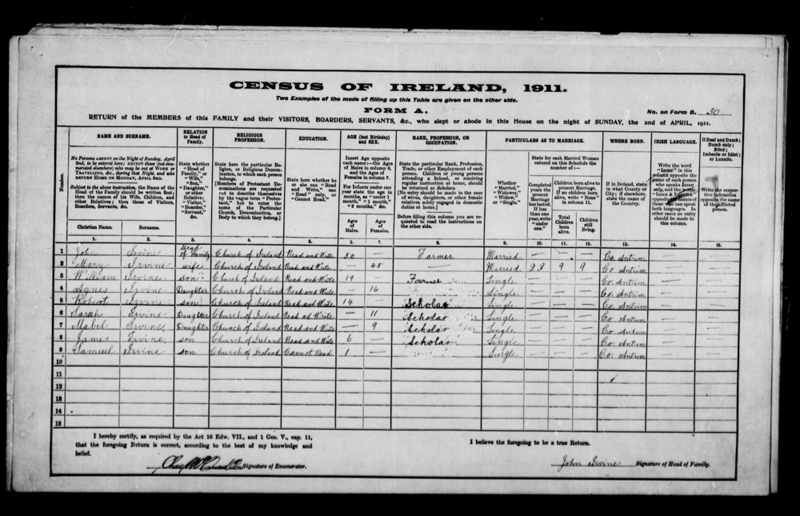 The 1911 census puts in him at house #30 Dungonnell (Seacash, Antrim) at age 19, the son of John and Mary Irvine. His parents were ages 50 and 45 and had been married 23 years. They had 9 children. John and William are listed as farmers and the religion is Church of Ireland. We also know they are literate as they could read and write. William (Bill) had two older sisters Jennie (b. 1888) and Minnie (b. 1890) who had immigrated to California in 1909. Jennie married Harry Gallatin about 1913. She died in Oakland California 16 January 1967. I believe Minnie married Louis Meyer (facts to be confirmed). She died in 1962 in Grass Valley, California. 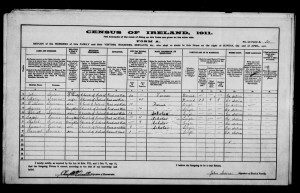 Included in the census are records about the buildings and the neighbours.